No bigger than an USB driver, (2 cm x 7 cm x 1.5 cm), the new K1 integrates the best GPS technology, notably the latest generation of the famous GPS SiRFstarIII processor, as well as a battery, giving it total autonomy and power worthy of the best GPS on the market. 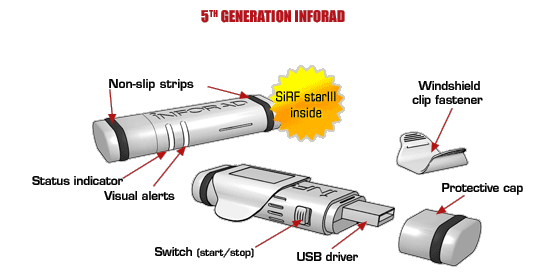 With the appearance of a black USB drive with a red stripe across each end, the K1 is the first in a new line of products called "Linea Rossa by Inforad," created to be identified at first glance and to offer security for the forces of order. The technique: the new K1 naturally inherits of all INFORAD�s technological savoir faire. K1�s small size allows it to be easily positioned in unobtrusive areas on any windshield, most often under the visor (clip supplied). In this way, its performance is always optimal, no matter which vehicle is used. To date, the K1 is the only GPS radar alert compatible with all vehicles. An indispensable partner for any driver, this small box placed on your dashboard or windshield will help you avoid speeding and reinforce your safety, all while keeping you from getting points on your driver�s license. Thanks to the GPS* system, INFORAD always knows where your vehicle is, and its processor compares this position with the risk areas contained in its database. As soon as you cross into a dangerous area, whether or not there is radar detected, INFORAD immediately alerts you through its simple and easily understandable light-up and audio signals. Thanks to its NMEA-0183 v2.0 compatibility, INFORAD, once connected to a computer through the cable supplied, allows you to use navigation software like Autoroute Express�, TomTom Navigator�, Route 66�, etc.... while continuing to protect you efficiently. A pilot software, INFORAD MANAGER was conceived specifically to use K1�s capabilities as efficiently as possible. Most notably, it integrates a function that is unique for this type of product: an interactive learning area to help users to better learn how to use their K1. NOTE: as for all INFORADs, adjustments and updates are done by an Inforad Manager software intermediary.Consequently, please uninstall the old version of Inforad Manager from your PC before using INFORAD K1.